Karnak, Ladakh. Karnak is an area of southern Ladakh, northern India, notable for it's lack of people. In 2007 we trekked there for 12 days, starting and finishing on the Leh-Manali highway. Trek day 9. The trail runs by a stream through willow groves before entering the narrow gorge where we saw last night’s wild goats. The gorge soon widens out into a wider green valley, the goats are high on the opposite cliffs; we pass edelweiss and plants that resemble sweet peas covered with thousands of large black and white caterpillars. 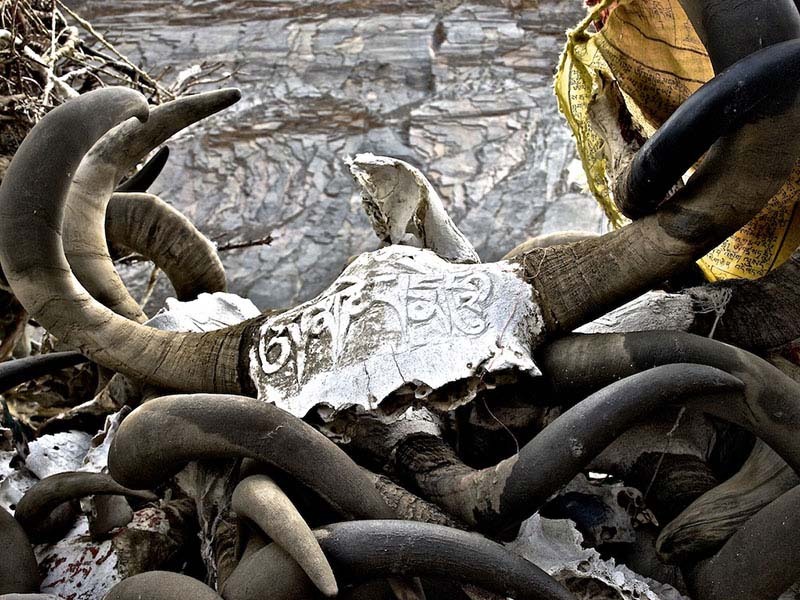 On the ground by a deserted settlement a white bleached yak skull is carefully positioned to face the head of the valley. Walking through long grass flanked by a smooth hillside of grey scree we pass a large rock painted with the coloured letters of On Mani Padme Hum, the Buddhist mantra you see throughout Ladakh. The valley narrows again and we rise slightly onto higher ground just before two stupas which announce a huge square of mani stones. We’ve arrived at Lhatoo, a spectacular collection of stupas and mani stones, some beautifully carved with images of the Buddha, where local people and nomads come to pay respect to the mountain deities. Lhatoo has an ancient presence - although the images are familarly Buddhist the sense is of something more connected to the spirits of the mountains and passes, I imagine it’s an old Bon site. Bon is the religion that predates Buddhism in the Tibetan Himalaya. I learn later that the local shepherds meet here once a year to pay respects to the old spirits. Only men are allowed to come. 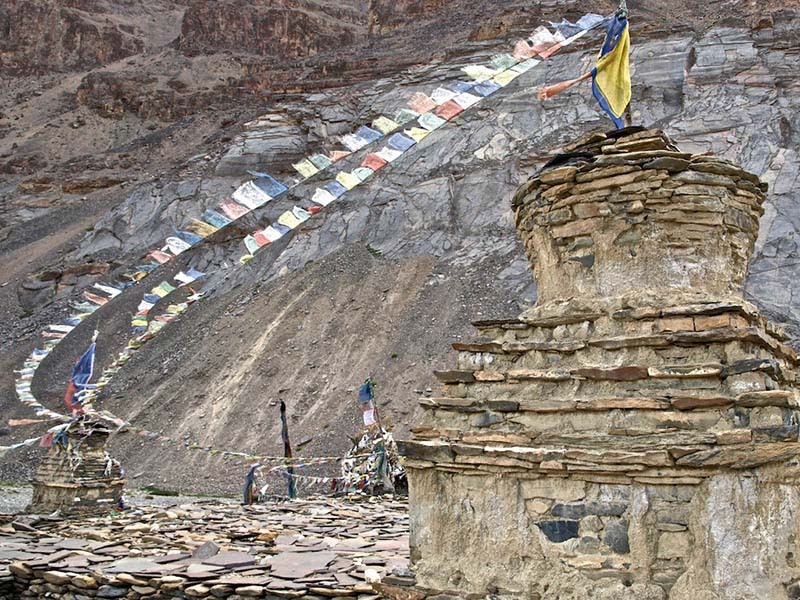 Worn and faded prayer flags, tall lahtos of willows and juniper tied with white scarves, piles of bleached blue sheep and yak horns, some carved with On Mani Padme Hum. Stenzin, our guide, reads some Buddhist texts from the carved stones. I climb a nearby hill for an overview; in the wind the strings of prayer flags arc horizontal in long elegant curves. 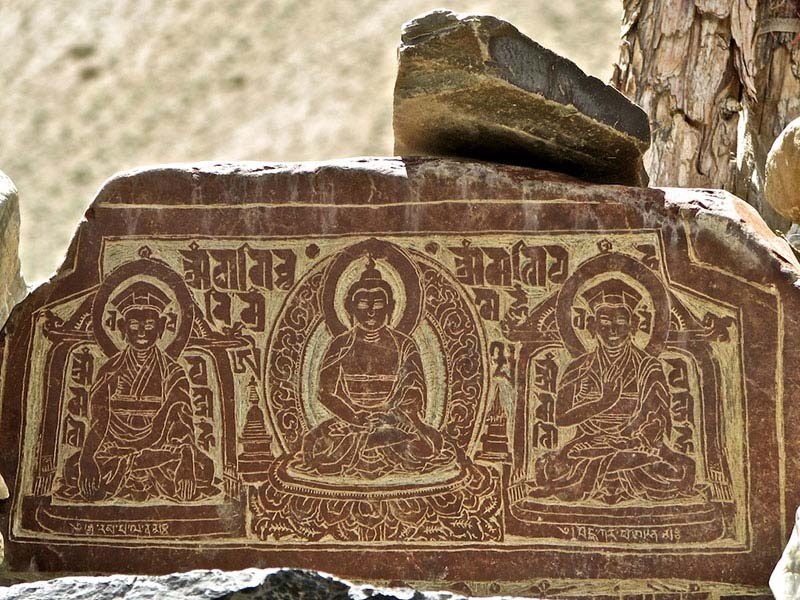 A finely carved mani stone has three different images of the Buddha showing different aspects of Buddha nature.